What to do when your Mentor Leaves Company? Having a mentor at workplace is something good about workplace as mentors are ones who offer guidance in work place. Mentors are ones who provide daily advice related to work in the organization and helps us cross the hurdles at work place. It can really be a tough situation when a mentor bids adieu from work. Employees lose the biggest advocate and closest friend at work place when a mentor leaves. Your mentor leaves a void behind as they leave and filling that up is mandatory. 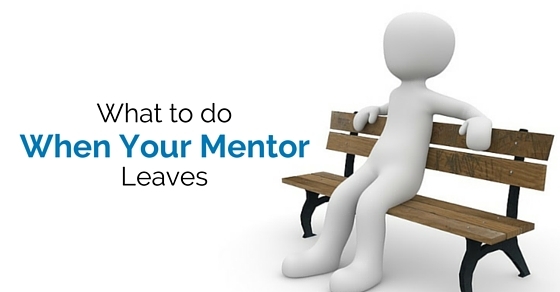 Here are a few pointers or hints about what to do when your mentor leaves. 1. Your mentor as a manager: Your mentor must have been a person to whom you reported every day. Your mentor would have known your strength, social skills and took advantage of them. In the same manner knowing your skills and talents, your mentor must have assigned you with analytical work or picked you for a project. Now when your mentor has left and a new person or manager comes to the position the changeover can be a bit tough. The new manager or mentor may not be that flexible as your old mentor but you need to work hard to win over them. Make sure to do an excellent and awesome work as before with complete enthusiasm. Take up new initiatives and work with energy and showcase your best skills and look for feedback from your boss. Though your new boss or manager does not behave like your mentor, take advantage and perform your job perfectly, once you’re receptive on the feedback you’re on the good side of your new mentor. 2. Find your next move: Though situation without a mentor is obvious, it is a fact that you need to find an alternative in the organization and keep moving. Instead of relying on one champion make the habit of building network for support rather than depending on one person. Executive career coach Ford R. Myers says that to face such instances people should cultivate relationships. When your mentor leaves, be ready to make your next move without confusion. 3. Finding new relationships: When you don’t have a mentor you are now responsible to gain visibility and obtain new relationship with seniors. You now need to dedicate special time to know about the projects and teams which you desire to work for and get associated with them. You also need to have enhanced communication with your colleagues when your mentor is absent to know the new initiatives in the project. Fresh and string senior relationship is a must on your own when your mentor leaves. For this to be made true you should focus on the interactions that takes place between senior ones, associates, as they are connected to network, in the same manner company functions, meetings and more are also vital. So when your mentor is not present take initiatives than waiting for recommendations. 4. Get forward with your career guide: Your mentor must have been your best career guide and outlined your weakness. Mentor would also help you overcome your weakness. When your mentor is absent, take it as an opportunity and get new perspectives. Check around and find few people in your office environment that can help you and guide you in career path by providing inputs. Try to ask for advice from others when you don’t have a mentor and slowly gain relationship with others. It is not necessary to have mentors all the time for providing career advice; they can be professionals within the organization who you can trust and respect. 5. Be yourself though mentor is unavailable: You can be an employee who is more associated with your mentor and may feel bad when your mentor isn’t present. Make sure you are clear and carry on your daily routines as usual though your mentor is not present. Else people around may conceive that you are also planning to join your mentor. 6. Keep up your mentor relationship: Though your mentor has left, your mentor was the person who stood up for you and guided you and hence maintaining their relationship is worth. Though you have a relationship with the past mentor it is never required to flaunt your relationship amongst others, your boss may doubt your loyalties and hence maintain the relationship as a personal one. 7. Handling present mentor or boss: Your present mentor or boss would know that you have contact with the previous mentor. In such a scenario he may feel insecure to know how the employee perceives him. Take this as an opportunity and mention that you’re glad and would like to have a positive relationship with the present boss. You can also mention that you are loyal to the company as a whole and not to one particular person, and that you’re glad to work with the new boss or mentor. This kind of calm and assertive approach impresses the boss. By this way smooth transition can be carried on with the new boss when your mentor isn’t present. 8. Keep learning: The present situation is an ever-evolving digital marketing landscape and has a lot to know every minute. Even if your mentor is not there to guide you keep learning everything that happens in and around your industry. Though your mentor is not present gain opportunities to learn more which is one way to expand your mind and would fleet. 9. Adding value to everything: Though your mentor is not there you should remember that you should add value to everything you do. You may have a to-do list each day and by the end of the day you should cross everything off and feel accomplished. Your mentor may have left but as an employee you need to learn new things and accomplish all tasks in a successful way. 10. Make your team a champion: Have your team and decide to celebrate each and every win of your team. Your mentor was the one who guided and brought you up in your team by providing adequate knowledge, and assistance. Once your mentor has left, make your team a successful, strong and happy team. Remember that the team should shine after your mentor has left as a mark of trust and assistance. Someone has offered their blessings and respected the team and hence it is the duty of the team members to enhance high and be successful. 11. Face any situation: Mentors are ones who promotes, advises and supports you at all times in the organization. You can obtain the visibility you require by having a perfect mentor within your company. They are perfectionist and ride their reputation with yours. It is a fact that some women lose their source of support and inspiration and finds it tough to stay in the company when their mentor leaves. It is suggested that even if the mentor leaves, the employees should find someone else with the same quality or else face the situation without any difficulty. So employees should be strong enough and face any scenario without being emotionally affected when mentor leaves. 12. Research results of mentoring: A mentoring relationship is the perfect and worthwhile relationship that one can enjoy when things go wrong. They would have provided you with a better vision of yourself in both professional as well as personal aspects. A survey by Marie Claire mentions that 66% of women confirm that networking and mentoring further their career makes them confident. When a mentor leaves an organization it is considered as a professional blow but that doesn’t mean that you career should be derailed. Career needs to keep going on though mentor is present or absent. Find alternative and keep leading in your career. Mentors are important and they keep changing as time moves on. Employees should bear in mind that once a mentor leaves there are other options to be followed for their career guidance and never are they left in dark. When a mentor leaves, other new mentors, boss or managers take up the responsibility and carry over the task. The employees should be flexible enough and adapt to all the situations that happen in an organization. They should know to manage themselves and their team in the absence of a mentor. There are few points mentioned above which offers a clear view about what to do when mentor left. People who are baffled because their mentors left and find it tough to carry on with their routine can read through these motivational points and become enthusiastic so that they lead in their career. Career is to be going on and on without any hindrance or hassles, learn and keep in mind all the good points the mentor has taught you and carry on your career in a successful manner.